Will I need glasses after my treatment? Will my vision change after my treatment? Is Excimer laser treatment painful? Laser Vision correction is a treatment that reshapes the cornea in order to produce clear vision. The laser vision correction procedure can treat myopia (shortsightedness), hyperopia (longsightedness), and astigmatism, and reduce patients’ dependency on contact lenses and glasses. Laser vision correction surgery eliminates the need for glasses in individuals by removing a predetermined amount of corneal tissue thus reshaping the cornea. This improves the eye’s focusing power and enhances the patients vision. The vast majority of patients have excellent functional vision for day-to-day needs and requirements without the need to use corrective eyewear; however treatment does not guarantee freedom from glasses and contact lenses in all cases. It must be remembered that patients who are approaching the age when reading glasses are prescribed (somewhere in the mid forties) will still need to use reading glasses to achieve clear vision to read or carry out work at a close range. Some shortsighted patients choose to leave one eye under-corrected to help reduce their dependence on glasses for near vision (monovision). Approximately 95% of patients who have low to moderate refractive errors (both short and long sightedness) will be free from glasses on a day-to-day basis, producing good functional and practical vision. These patients however often choose to have a weak pair of spectacles to help have their vision fine tuned, when driving at night or watching subtitles at the movies. Patients with higher degrees of refractive errors cannot expect to obtain these same results, for example between 80-85% of highly shortsighted people can expect to be able to hold a drivers licence in NSW without spectacles. They are more likely to be dependent on some form of eyewear to fine tune their vision. As the degree of refractive error becomes higher then the need for corrective eyewear is more likely. This group of patients is also more likely to need an enhancement to obtain the optimal results. There is no additional fee for enhancements within 12 months. There are two procedures which use this unparalleled precision by applying computer controlled pulses of laser light to reshape the eye for visual correction. These are PRK and LASIK. 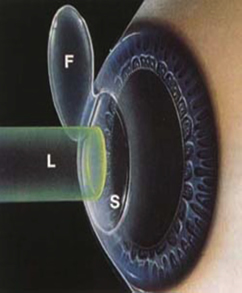 PRK, or photorefractive keratectomy, is a refractive surgery technique which reshapes the surface of the cornea, while LASIK, or laser in situ keratomileusis, reshapes the inner layers of the cornea. Both procedures work incredibly well to correct mild to moderate degrees of shortsightedness, longsightedness and astigmatism. The difference between LASIK and PRK becomes apparent when comparing the speed, comfort of visual recovery results and risks involved in treating very shortsighted patients. It must be understood that the final visual results are a combination of the laser procedure itself and the patient's own healing pattern. LASIK is the overwhelming procedure of choice for most patients. This is a technique where one eye is deliberately left under-corrected in cases of shortsightedness or deliberately over-corrected in cases of longsightedness to provide clear near vision. Monovision can eliminate or reduce the need for reading glasses, but many patients find it difficult to adapt to this situation unless they have had some experience with deliberately altered corrections in their eyewear prior to undergoing treatment. Once the results have stabilised the vision you have tends to be maintained, although there might be slight variations with time due to normal physiological variations in the refractive power of the eyes. LASIK usually stabilises earlier than PRK with patients usually stable at three months with either procedure. Higher powers can expect a small amount of regression to occur over time, but this is normally planned for in your treatment. Should there be any significant variation an enhancement can be carried out. In the past PRK was quite painful but not now with the use of a modern bandage soft contact lens. Severe pain has virtually been eliminated. There is minor discomfort, which is usually relieved with mild analgesics such as Panadol. All patients are given anti-inflammatory drops, which inhibit the pain cycle until the contact lens is removed when the eye is healed (by the third day after treatment). All patients are seen the following day. The majority of patients can return to work within 24 to 48 hours. Both LASIK patients and low powered PRK patients using a bandage contact lens usually have good functional vision within 24 hours. The vision may fluctuate over the first few weeks after surgery but most patients are comfortable returning to work the day after they are seen for their first post operative visit. The operated eye is blurred immediately after treatment. It is advisable to have someone with you to accompany you home. You will not be able to drive yourself home. Remember however, each patient’s symptoms after treatment vary and you should only drive when you feel confident.